Banana Cream Dessert is out of this world awesome. Simple ingredients, simple directions, equals simply delicious. 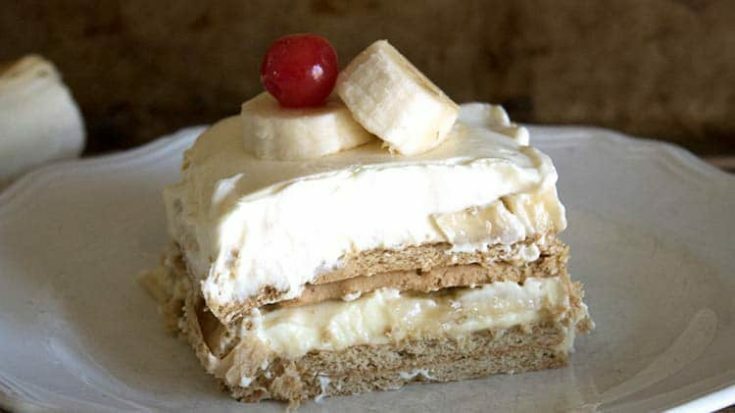 Banana Cream Dessert is very similar to Fruit Pudding, but it’s combined with graham crackers and put together in a rectangular pan instead of a bowl. Pudding mix, milk, whipped cream, bananas and graham crackers. That’s all you need to whip up this super fast snack that your family and friends will rave about. Make sure to save this recipe and print out a few extra copies, because I guarantee you’ll be asked how to make it. Probably more than once. Gather your ingredients, and you’re ready to begin. First, mix together the pudding packets with 3 cups of milk. Whisk together for a couple minutes to thicken. Add in whipped cream. If you keep your whipped cream in the freezer like I do, toss it in the refrigerator the night before, or soften in the microwave. Mix the whipped cream together with the pudding until its combined nicely. This is my favorite part, because you know there is always a spoon to lick clean, and I do love my whipped cream. Once the pudding and whipped cream are mixed together, you’re nearly done. It’s that easy! All that is left is to build the dessert. I like to start with graham crackers on the bottom of the dish, add a layer of pudding mix, sliced bananas. Follow that with another layer of graham crackers, pudding and bananas. Then add a final layer of graham crackers and pudding. I’ve tried this dessert out in both a 9×13 pan and a smaller rectangular pan that is pretty tall. The pudding layers are just a little thicker in a smaller pan. When this beauty is complete, stick the Banana Cream Desert in the refrigerator for a few hours (or overnight) and serve! Add some chocolate sauce when it’s time to serve and make this a Banana Split inspired dessert creation. Serve it up and relish the banana goodness. Try it out and see what you think. Me… I’m going to be serving this up the next time I have a cookout. I’m thinking Black Bean Salsa, Guacamole, Perfectly Grilled Chicken Halves, and then Banana Cream Dessert. Yum! Mix together pudding mix and milk, whisking for about 2 minutes to combine well and thicken. Mix in whipped cream (if frozen soften in microwave or refrigerator overnight). Layer graham crackers, pudding mix, and bananas in rectangular pan. Refrigerate for a few hours or overnight and serve. This looks delicious and it’s nice that it won’t head up the house, too!